One of our newest runners, Amy Sullivan is gearing up to cross the finish line this year for the first time after three years of training. Amy’s first attempt at running the marathon in 2012 ended abruptly when she was diagnosed with a hip stress fracture and was forced to defer. By the 2013 marathon, Amy was trained and ready to finally complete the race, but she was stopped less than a mile from the finish line. Amy’s dedication and unwillingness to give up inspires us all, and her motivation is infectious. She and the rest of Team JAF are training with more determination than ever, and we can’t wait to cheer every last one of them on next month! Click here to help Amy meet her fundraising goal! Amy: I was introduced to the Joe Andruzzi Foundation by a friend who ran for Team JAF in 2012 & 2013. 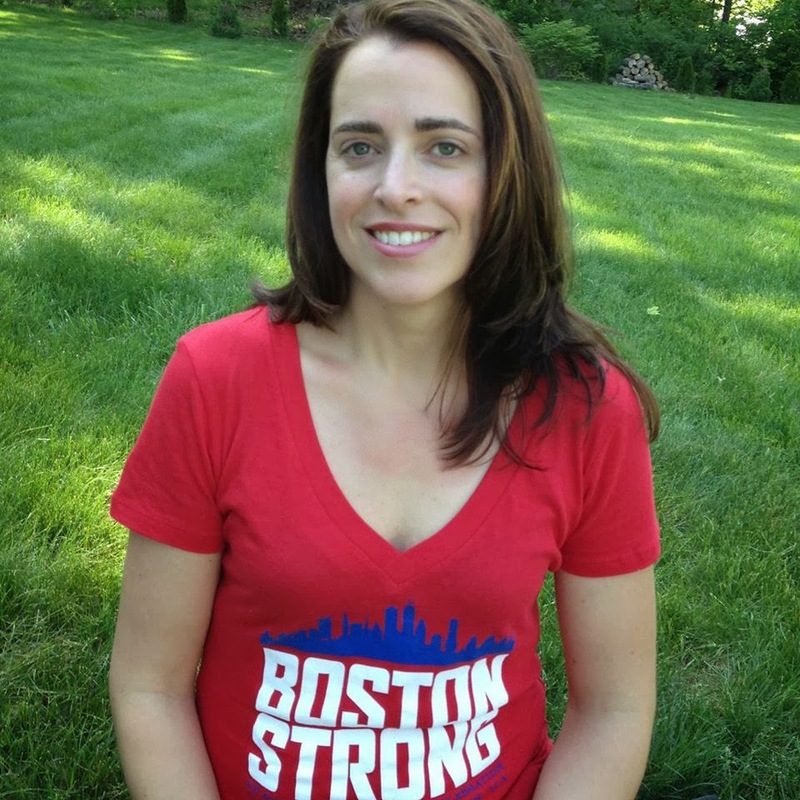 I trained both years to run Boston with her and joined her on a few of the JAF charity runs. I quickly saw what amazing work the Foundation does for families dealing with cancer’s burdens. Multiple family members of mine have dealt with the financial hardships of cancer, all while trying to care for their loved ones – and it is great to see a foundation like JAF that provides the necessary assistance to those in need. Having been unable to complete the Boston Marathon the past two years, I knew if I attempted to train for it again, I wanted to raise money for a charity and there was no doubt in my mind that I would run for the Joe Andruzzi Foundation. Amy: $2,000 was my original goal, but I have already surpassed it! My new fundraising goal is $2,620 just because of the number, but I also hope to exceed this and reach over $3,000. I’ve been reaching out to friends and family. JAF: Have you ever run a marathon before? If so, which? When & how often? Amy: The only marathon I have completed is the Shires of Vermont Marathon. They invited anyone that didn’t finish the Boston Marathon after the bombing to Vermont to finish. Vermont is where I was born and raised, so I thought it would be a great place to find a little closure mentally after the bombings. When I was training for the 2012 Boston Marathon, I finished the 21 mile training run and hours later could no longer walk. I was diagnosed with the beginning of a hip stress fracture. That was the year of the heat wave and I was amazingly allowed to defer. Last year, I made it through all the trainings with the 21 mile run being a huge milestone for me. Second time’s a charm right? Then I made it to 25.5 miles and was stopped. Amy: Training is going well. This year I have had to motivate myself. I have been using the Hal Higdon Marathon training plan. I get up at 3:45 a.m., and if the weather is bad I head to the gym and run on the treadmill which I lovingly refer to as the “Dreadmill.” If the weather is good, then I drive to work in Framingham and run in the office park where the roads are clear and there is lighting. People say I’m crazy to get up that early, but I run at that time because I am a mom and it works best for me. Amy: Even though I run alone most of the time, I consider my teammates and other friends training for the marathon as accountability partners. I don’t want to let myself or them down. I also am inspired to finish what I started every time I see posts for the Boston Marathon. My other motivation greets me every day. The Boston Marathon Poster in my cubicle at work. Social Media is amazing as well. I have people that follow me on Tumblr, Instagram and Nike Plus rooting me on from all over the world. Amy: I did a Super Bowl fundraiser and raised $1,000, and I plan on continuing to reach out to all my amazing friends and family. I have also reached out to the local paper to talk about running. My husband is going to run with me this year as well. He said I was crazy the last two years, but in light of what happened last year he has joined me in training to finish his first marathon. Amy: I have done other charity work, usually because of a friend. I had a friend that ran for JAF for two years and decided that if I was going to finish the marathon this year I had to do it for charity. Amy: My husband was at Forum last year. Because of that, I will forever have a connection to this organization. When I was stopped and told about the bombing my first reaction was, “What do you mean? Chris is at the finish line.” My husband was at Forum and left a few minutes before the bomb went off to go to the Grandstand to watch me finish, across from the first bomb. I feel blessed that he was between those two places that day. Finishing this year will be such an amazing day for me and my husband. It really will be an honor to finally finish the Boston Marathon wearing the JAF jersey. Amy: I just love the running community. We come in all different shapes, sizes, ages and abilities. Running does not discriminate. A mile is a mile no matter how fast or slow you do it. I see it in every race I do. JAF: Do you have a “theme song” and – if so – why is it YOUR song? Amy: That’s easy this year. I do this for everyone affected last year. I do this for everyone who can’t. I run to show people how strong the running community is. I run to make my family and children proud. Amy: It’s so much more mental than physical. You have to push yourself mentally. Amy: Real, but the first few miles are always horrible.